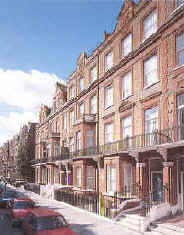 Rosary Gardens is a quiet residential street in central and exclusive South Kensington where three charming Victorian town houses make up Astons. Offering a high level of accommodation for up to 4 people these one room apartments offer immaculate and recently renovated units all with ensuite bathrooms and kitchenettes. All flats have phones and satellite TV while the designer rooms have hairdryer, bathrobes, marble showers, iron, safe and trouser press. The office will send and receive faxes, take messages when you are out and generally look after your every need.